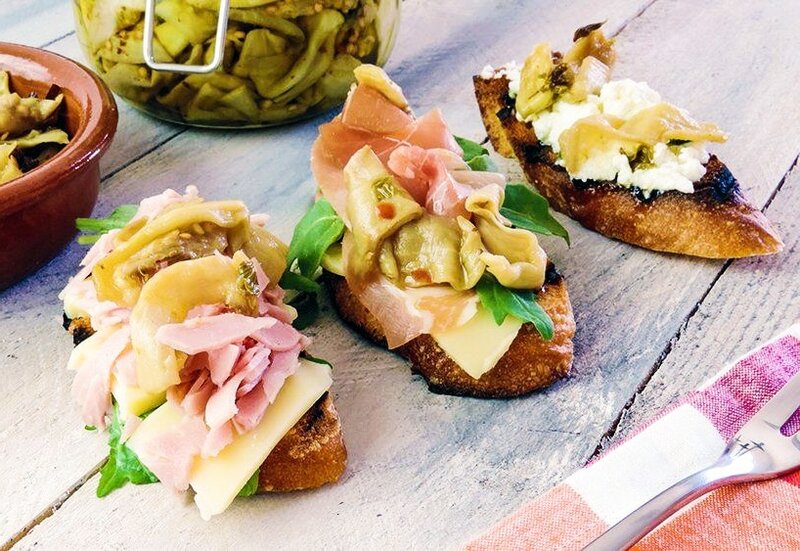 Pickled Eggplant are a delicious and traditional Italian accompaniment to crostini or just eaten as a tangy snack. 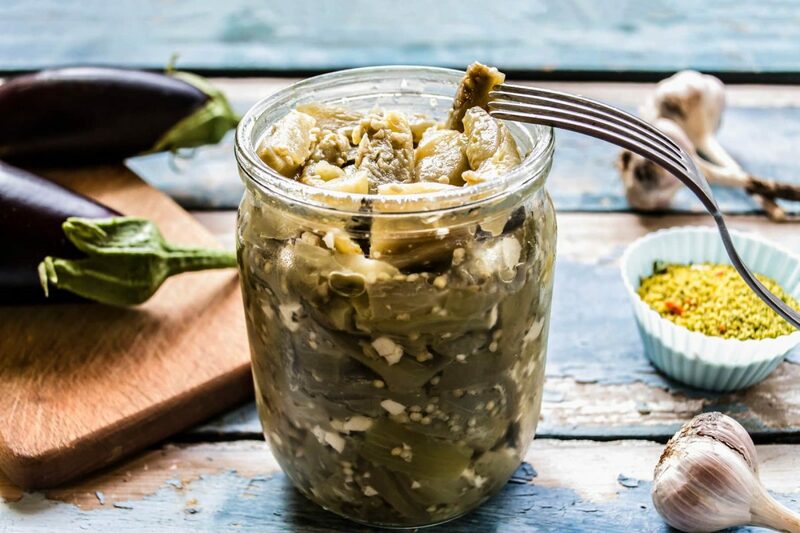 To preserve the eggplant in extra-virgin olive oil requires you to be patient, because it needs to rest for at least one week to absorb all of the herbs and garlic and flavor. 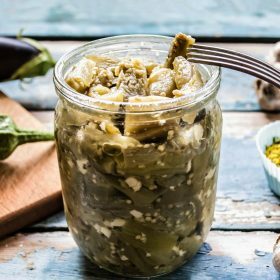 Pickled Eggplant have a deliciously smooth and tangy flavor, definitely a tasty way to start a traditional meal and served as an antipasto. I used it in three of my favorite crostini: Homemade Thyme Ricotta, Prosciutto Arugula and Groviera, and Ham with Mozzarella. A perfect topping to each of these flavorful starters. Ever seen those jarred pickled Italian vegetables in olive oil? Now you can make yours too with this pickled eggplant recipe. With the help of a mandolin, slice the eggplant into 3/16 inch pieces lengthwise, then cut the slices into strips and then crosswise into 3-inch pieces. Layer the pieces of eggplant in a large colander and generously sprinkle each layer with Kosher salt. Place the colander in the sink, put a clean kitchen towel on top of the layered eggplant and top of the eggplant with a tall pot filled with water to weigh the eggplant down. This helps to squeeze out the bitterness of the eggplant. After two hours, take off the weight, remove the towel and rinse under cold water for 2 minutes. Transfer to a large kitchen towel. Put a handful of eggplant in a ricer and squeeze out as much liquid as you can until you have used all of the eggplant. Transfer to a large bowl and cover completely with white wine vinegar. Put a towel on top and weigh down with a pot filled with water. Leave them for an additional two hours. 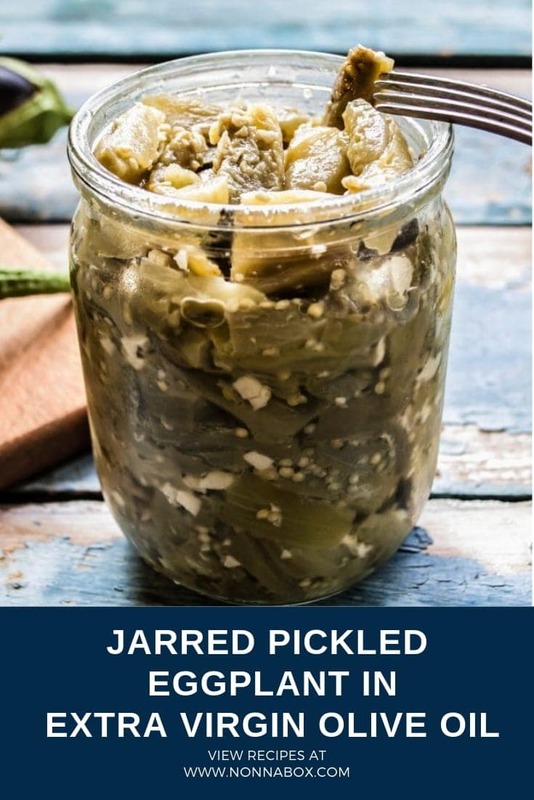 After the jar is sterilized and dry, add 1/4 cup of the best extra-virgin olive oil, place some of the sliced garlic, a sprinkle of oregano, some sliced celery and chili pepper flakes to taste and set aside to flavor. After two hours, remove the eggplant from the vinegar discard the vinegar and transfer into a clean bowl. Using a ricer squeeze as much vinegar out of the eggplant as you can. Start placing them in the jar with the seasoned olive oil, leave about one inch at the top and fill the jar with the extra-virgin olive oil. Push them down to release any air! Lock the jar tightly and place it in a dark, dry place. Let them rest for at least one week before using them.